Kylie, Dannii, Tina, Collette, Melissa, Toni... Australia had had its fair share of young female pop stars in the previous few years, but when it came to their male counterparts, there'd really only been Jason Donovan. Male solo artists in this country tended towards rock music, but this week in 1992, a 19-year-old teen heartthrob from the Gold Coast jumped out of the pages of Smash Hits and into the top 50. For a brief period of time (as it so often goes with pop sensations), he was massive - first in Australia and then in the UK. And it all kicked off with his second single, which succeeded where his debut effort had not. As 1992 came to a close, Whitney Houston leapt to the top with "I Will Always Love You". The Bodyguard mega-hit spent its first, second and third weeks at number 1 as the ARIA chart shut down for Christmas. It was one of the better tracks from Waking Up The Neighbours, but there was little chance this ballad would do very well this late in the game. After five hits from the album, it became the first to miss the top 50. Louis Armstrong's original version had been a belated chart-topper in 1988, but this duet between acquired taste singers Nick Cave and The Pogues' Shane MacGowan made little impact. Another cover now - this time of a song written and originally performed by Tom Waits in 1976. Despite incorporating elements of such an iconic Australian song, it failed to ignite local interest. The single that should've been chosen to follow "Ain't 2 Proud 2 Beg" was TLC's third consecutive US top 10 hit and provided a slight chart improvement here. For the second single from her second album, Chameleon Dreams, Margaret Urlich did something new - she released a song not produced by Robyn Smith, who'd been behind all her singles to date. Instead, she chose a track produced by American Ian Prince, who'd worked on "She Ain't Worth It" by Glenn Medeiros featuring Bobby Brown, and a bunch of tunes by pop/R&B artists like Karyn White, Sheena Easton, Elisa Fiorillo and Stacy Earl. Apart from being a little bit more upbeat that her previous singles, "Human Race" maintained Margaret's easy-on-the-ear pop sound but didn't become another top 50 hit for her. He hadn't made much of an impression with debut single "Drive Me Crazy", but everything changed for Peter Andre with his second offering, a remake of "Gimme Little Sign", which became the highest-selling single by an Australian artist (and 12th overall) in 1993. Not bad for a song that only got to number 3, although it did stay there for six straight weeks. Originally recorded by Brenton Wood in 1967, "Gimme Little Sign" had been an international top 10 hit. Peter's pop update of the tune was the perfect summer jam - breezy and upbeat, with a beachside music video that allowed him to show off the type of Michael Jackson-style moves that'd clearly got label boss Molly Meldrum's attention when he'd appeared as a contestant on New Faces in 1989. The clip also allowed Peter to bring out the big guns... and his sculpted six-pack. Indeed, as well as his voice and dancing ability, a big part of his image - and appeal with certain demographics - was his willingness to flash the flesh. In more ways than one, we'd be seeing a lot of Peter over the next few years, with five more top 20 hits to come before the UK claimed him for themselves. More homegrown pop now with the latest from Australia's premier girl group. The fourth single from debut album Make It Come True, "Bad Attitude", as the title suggests, saw the girls in feisty mode (well, for them) as they sang about a bad boy love interest, who, in the music video, proved his rebel cred by playing guitar and wearing a leather jacket! A move away from the American R&B-influenced sound of their previous singles, the song was a rock-tinged pop track that gave them another top 30 hit to add to their tally. Next time: we commence our trip through 1993 on January 10, with an eclectic bunch of new entries, including a bit of folk rock, some world music and a bit of local dance music. Before that: I'll complete my look back at 1984 with the final chart for that year, which means this blog will now contain every ARIA singles chart from the very first one in mid-1983 till the end of 1992. Plus, as usual, I'll count down my favourite songs of the present day with my top 100 for 2017. Merry Christmas Gavin! Looking forward to your recaps of 1993. Just discovered this blog just as the best year ever comes to a close :) So good! 'Do I Have To Say the Words?' was possibly the first Bryan Adams song I 'liked', though I've since gone on to appreciate some of his earlier hits (but never 'Have You Ever Really Loved a Woman'). I liked the contrast between the major-key verses and the (I assume, I could be wrong) minor-key chorus, which is not the typical song structure. Don't think I'd seen the Rod Stewart video before. He certainly looks different in it. I'm definitely not a huge TLC fan, but I liked 'What About Your Friends'. 'Human Race' was boppy, but sounding a little dated probably by this point. 'Gimme Little Sign' seemed to stick around and never leave the charts, like a few other singles from late '92/early '93. I loved this send-up of it from The Late Show - https://www.youtube.com/watch?v=4MoIL6-iWdE . 'Sooner or Later' aside, 'Bad Attitude' is probably my favourite Girlfriend single. I love the hilarity of the squeaky-clean girls next door image trying to be edgy, and the "I think you're pretty but you're too tough" lyric. The end of year chart is another that seems a bit dodgy, e.g. Kate Bush's #2 'Rocket Man' only ending up at #100 and below some much lower-peaking songs, like R. Kelly's #28 'She's Got That Vibe'. But, someone analysed in greater detail on the australian-charts.com forum and apparently it's like the first quarter of the year doesn't exist when this chart was calculated. Maybe sales really were a lot lower then... due to the recession? It's also interesting how the #5-peaking 'November Rain' is placed at #2, though that seems believable, given its long stretch in the top 10, which wasn't over yet. 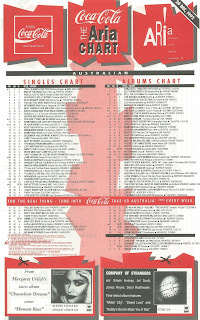 I forgot to mention – I thought Take 40 Australia was going by the ARIA chart, after all that's what it says on the chart itself! But when they played their year-end chart on December 19, 1992, Nirvana's "Smells Like Teen Spirit" was number 30, and not 46 as on ARIA's chart. Quite a significant discrepancy. The other songs are in more or less the same order. Did they suddenly and inexplicably switch to the AMR chart that night? I still have the recording of the whole broadcast on cassette (with only 10 songs in full to make it fit). 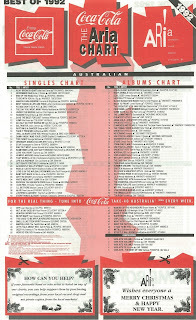 Take 40 only started airing the ARIA chart in January 1989. What they used before then, I don't know, as it wasn't the AMR chart either (e.g. 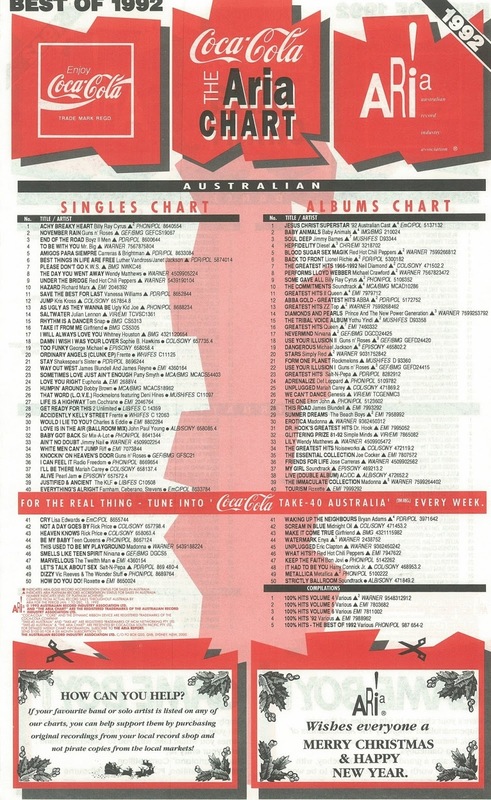 some late 1988 peaks that differ from both charts I remember from Take 40 are: Bangles 'In Your Room' #28, Bananarama 'Love, Truth & Honesty' #29, Voice of the Beehive 'Don't Call Me Baby' #35, Jason Donovan 'Nothing Can Divide Us' #1). Their end of year charts, at least those I tuned into, were different from ARIA's. I remember listening to the 1989 one, which was quite different (and still have it written down). They also aired a 'top 40 of the year so far' chart in July 1992 in place of the regular chart one week, and a 'top 40 artists of 1992' chart at the end of the year (I remember Shakespears Sister were #39). I didn't tune in to the end of year top 40 for 1992 show, though. That's interesting -- I wonder why they didn't just go with ARIA's year-end charts. Did the 1989 one aired by Take 40 feature any glaring discrepancies Nathan? I do remember their once-off July 1992 chart, from what I remember Barry Bissell called it the "mid-year stocktake" chart. I think I wrote down half of it. I probably listened to the 'top 40 artists' chart, but had forgotten about that one as I didn't write it down. Pete, I'd need to dig it out to check, but I'm pretty sure 'Kokomo' was the #1 single of 1989 on it, as I had been expecting (given it spent the most weeks at #1 in 1989). Yazz's 'The Only Way Is Up' is another I remember being in it. I'm pretty sure it was Gavin who mentioned in one of the blog posts that Take 40 Australia originally combined the Aria/Kent Music Report with different radio airplay charts to form their own chart, so they didn't have to pay anyone for it. (If not, it was in a similar blog). Boring musicianship lesson: with regard Nathan's comment on "Do I Have to Say the Words", he is right in that it moves from D Major in the verses to d minor in the chorus. The reason it is striking is that moving to the tonic minor (ie. "D" to "d") is much less common than moving to the relative minor (ie. where they both have the same key signature).